For more than 3 years, I’ve been writing The Cranky Flier to provide opinions and general information about the latest with airlines and airports. Today, I’m officially launching what I think is the next logical extension of the blog . 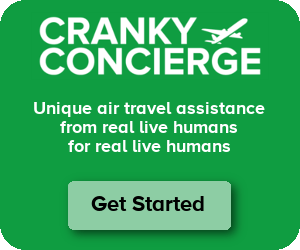 . . Cranky Concierge, a personalized air travel assistance company. We’ve been doing testing for a couple of months, and I think that the most exciting pieces here are the Flight Monitoring and Delay & Cancellation Assistance. With Flight Monitoring, you’ll receive an email before your trip outlining your flight info, potential delays, weather, and a description of where your airplane is coming from before your flight. We’ll monitor this throughout the day leading up to your flight and keep you apprised of any changes to your flight status via email or SMS. In testing, we’ve been able to notify travelers of delays long before the airlines update their own flight statuses. We are not a travel agent, so we don’t actually handle booking but rather just give you options. When it comes to helping fix problems when they go wrong, we’ve had great success. In one example, clients were traveling from San Francisco to Denver via LA (the only itinerary on which they could get a ticket using miles) The flight to LA was late and would miss the last flight to Denver. There were no seats on the nonstops to Denver, so the airline said that they would have to wait until the next afternoon. a flight from LA to Colorado Springs that had room and that they would make with time to spare thanks to a slight delay. They suggested that to the airline which gladly put them onboard. We found them a cheaper rental car in Colorado Springs and they made it that night. That’s the power of having an airline dork on your side. We’re starting small and only offering this to US residents right now, but we are planning to expand over time. We are looking to build our network of airline dorks as demand grows. In particular, we’re looking for airline employees with flexible schedules (hello, flight attendants) who might be interested in joining the team on their days off. Send me an email at brett@crankyconcierge.com if you’re interested in learning more. This service is not meant for those people who like to do everything online independently. This is meant for those who don’t have the time to spend on researching everything themselves. It’s also meant for those people who don’t have the deep knowledge about the industry and simply want someone to help them with the process. As I said, I see this as a natural extension of the blog. Hopefully this service will be worthwhile for many of you. It will help me make a living while still providing the same great content on the blog for free that I provide every day. From time to time, I’m sure I will post successful assistance efforts here on Cranky Flier so you can learn how to help yourself when you’re stranded. Nice job, CF! Your “Dork expertise” will help us all out! Another question : if we were on such a trip, and a local airline for some reason couldn’t fulfill their obligation to us, would you be of use in arranging train or car service, or are you absolutely limited to air travel? Weird questions — but I’m curious as to the extent of your service on offer. What a great idea. While I don’t see using it myself for the reasons you state, I could totally see buying the service for my girlfriend when she flies by herself if I know I can’t be around to help her from afar if something happens. This service also seems like a natural match for parents who have to put a minor on a plane alone — you may want to consider marketing it to that group as well. This looks great. Like Andrew, I think many of the people who like reading your blog are amateur airline dorks themselves and probably like the digging and the process. But for sig others, friends and family, this seems like a great idea. A great gift perhaps around the holidays. I wish you well with this venture. So, as an example, if I wanted to book some complicated travelling from the US to and through various African countries, would you be of service in helping me evaluate and arrange flights with local African airlines, or with bush pilot services, for example? These aren’t weird questions at all. We can absolutely help with this kind of thing, though for something as focused as bush flying in Africa, you might want to go with someone who specializes solely in travel on the subcontinent. They might have greater resources to know about operations that may not be easy to find. That being said, we’re happy to help with this. For now, I am the one providing the service, but I have others lined up to help when volume starts to grow. So I figured I would start using the collective “we” and “us” because if volume grows (I’ve already had my first customer sign up), I have others lined up to jump in. I wonder if you would also be able to help mileage runners who want the longest, least efficient trip possible? Interesting concept. I’m tempted to try it out just to see how good you are, although I’m enough of a dork to probably do almost as good a job as CF himself. This does sound like something very useful for corporate flying. That’s when time IS money and even a dork can get caught up with other business and forget about watching a flight, etc. Not sure how I pitch it to the boss. Our old full service travel agency was supposed to provide somewhat similar service but we already ditched them for a cheaper no-frills service to save money. Another $30~60 per flight might be a tough sell in this economy. I’ll push hard as I can for you Cranky. I posted your blog onto my Facebook page, Brett. It sounds like a great idea for those who don’t have the time, or inclination, to do their own hunting and fighting. Go Cranky! Best of success to you. I know I would recommend you to others if the need arises. I can certainly help with that, though there are people who specialize in this sort of thing. Granted, it’ll cost you a lot more to get their expertise (eg Gary Leff at View from the Wing or Lucky at One Mile at a Time. Another $30~60 per flight might be a tough sell in this economy. I’ll push hard as I can for you Cranky. Yep, it’s always tough to get people to part with their money when it’s an add-on service, but I’ll just keep working as hard as I can to prove the value. When things go wrong, the value is there without question. But even when things go right I’ve had people tell me that it was worth it for the peace of mind. This is per itinerary not per passenger, so it can be a great value for a family. Thank you, Alan. I forgot to post it on Facebook. I need to do that. I tested this in the early stages, and I was really pleased with it. Its really nice knowing in advance what is happening, and knowing that you don’t need to book it to your gate. Also, since most of the time when I’m traveling I’m dealing with the ground logistics (e.g. getting to the airport) I don’t really have time and/or sanity to put toward checking in on the plane side of things. Although, I’ve got a combo flight down, and train ride back from San Francisco set up for the thanksgiving holiday. I’m guessing you don’t cover the train side of things eh Brett? Hmm, not sure what I can do if things go wrong on the train. It’s not like there are competitors, though I can always look at flight alternatives if (when) the train is delayed. Any chance you will be marketing just the notification/information side of the service? I like the concept but I have to use my corporate travel agent for bookings. They don’t do the notification stuff so I would be willing to pay extra to have that. Hmm, I suppose I could look at offering the notification piece separately if it was just notification. If it was notification and disruption assistance, the price would stay the same since that’s going to be the bulk of the work for most people. The planning piece is more of a bonus here. I will be re-evaluating pricing as I go, so please give feedback. Are people interested in just a notification option that would possibly require additional payment if disruption assistance was required? From my perspective – there would definitely be value in some kind of “a la carte” offering. When I’m traveling on business, I probably don’t need the disruption assistance or planning since I have to go through my corporate TA, but having the notification would be cool. Yes, I’d consider myself sufficiently well-versed to do most of that stuff myself, but depending on the price, it may be worth it to have someone else do it so I can squeeze in some extra productivity. For personal travel on a complex itinerary, though, I’d be more inclined to spring for all of the services. I could even see some people who don’t need the planning/notification/disruption service, but would be willing to pay for the dispute resolution piece if something goes wrong afterwards (I know I would…). Also, have you considered some kind of sliding scale pricing based on the complexity of the itinerary? To me, at least, it would seem that a complex multi-carrier, multi-stop itinerary would take more of your time and energy than a simple non-stop city pair. From my perspective – there would definitely be value in some kind of “a la carte” offering. When I’m traveling on business, I probably don’t need the disruption assistance or planning since I have to go through my corporate TA, but having the notification would be cool. . . .
As a former airline pricer, I have thought about nearly every possible way of segmenting my pricing and I’ve resisted every time. I need to keep my pricing simple, so that means having a price which will fall in the middle. That means that some people will get more value out of the service if they have massive flight problems, but everyone will still get great value by having piece of mind along with the notification service. I would potentially look to break out the notification piece, but it does create some problems about where you draw the line between notification and assistance. I totally agree. I think if your notification service is automated you could charge a monthly or annual fee for just that. Then maybe offer a 10%discount on the human interaction side of things. Keep a CC on file and then charge if anyone emails you. Anyway, just talking out loud. I’m thinking about times that I would have really enjoyed having this service around… and it occurred to me that you might be useful in helping someone find a way to use those “free” tickets they “give” you when you volunteer to give up your seat on an oversold flight. I’ve done that twice, and both times I wasn’t ever able to actually USE the “free” ticket I was given, despite attempting to make flight plans multiple times over the year available. I’ve always suspected that someone–with either more time than I or more knowledge of the sneaky ways that airlines manipulate ticket availability–would be able to figure out some itinerary that would use up the “free” ticket with the least amount of add-on fees. I would gladly pay $30 for that! Oh yes, the evil “free” flights. The first thing to do is ALWAYS ask for a dollar voucher. Sometimes they’ll do it and you’ll be much happier. But if you do find yourself with one of those vouchers unable to use it, I would be happy to hunt for something worthwhile. It’s not easy, but I’m game! Orbitz used to offer a service like this for prime customers, not sure if they still do. They hired primarily flight dispatchers (no bigger group of airline dorks anywhere) because they had the experience of working in an airline OCC and knowing how weather and other issues would impact operations. They were supposed to be proactive problem solvers for people who booked with Orbitz. I think if your notification service is automated you could charge a monthly or annual fee for just that. Then maybe offer a 10%discount on the human interaction side of things. The simple fact of the matter until Cranky Concierge gets really big and can start tracking most of the flights by default, automating this won’t be really useful. The information I got from Cranky on one of the delayed flights I had was really worth it, and gave me a great background to what was actually happening, and automated system can’t do that. Excellent idea Brett and I wish you the best of luck (and Money), however don’t underestimate the work load as when people pay they get demanding and worse keep changing their minds and keep sending email after email…and remember you still have to do the other stuff as well…may the force be with you. excellent idea and a much needed service. there are just so many traveling who are not as aware/experienced that would love the customized assistance. i was just curious, how would you be able to handle all that demand? i can see you getting flooded left and right! So far so good, but I have had very good demand. I am currently talking to people about joining once the demand gets high enough. I, of course, need to be very careful about who I involve.